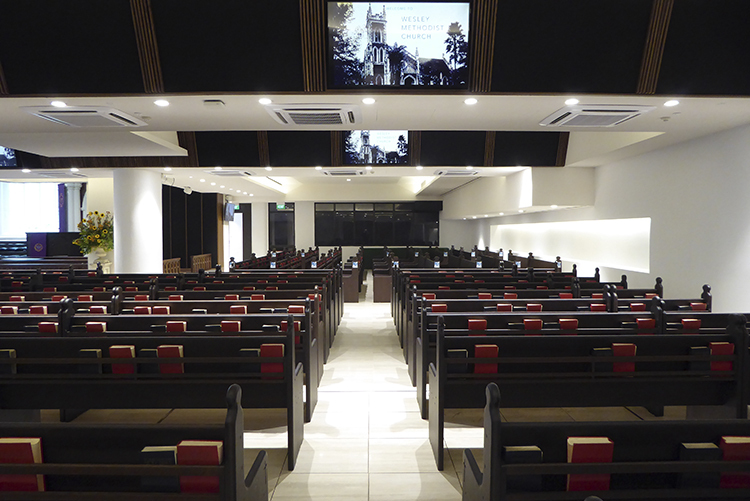 Wesley Methodist Church installed with Singapore’s first 3.1 sound system in a House of Worship. 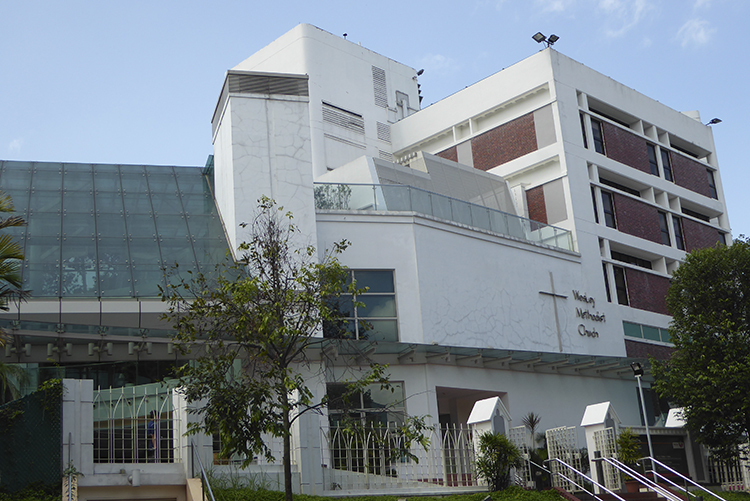 Mr. Ronald Goh, together with his company Electronics & Engineering Pte Ltd returned to oversee the extensive expansion works at the Wesley Main Sanctuary. Upon studying the new seating arrangements from the Architects and in consultancy with Mr. Steven Sockey from Truephonics Consultants, Mr. Goh proposed a 3.1 sound system for the Main Sanctuary seating as well as for the pew style seating in the Baptismal Hall. Every seat in the church is now served by a center speaker channel for the sermon or dialogue and a pair of left and right speakers for the choir and musical instruments from a 25-piece Band during feast days, including eight 12-inch subwoofers for the ‘Uhmm’ factor. The main intention was to create a true 3.1 sound experience for the congregation and to bring the sound from the choir and musical instruments out onto the congregations towards the rear so as to fill the whole church with music rather than just for the front pews. From the altar, the main Sanctuary extends 40-metres forwards to the main entrance, whilst shorter 20-metres lengths are offset to the left and right, for which the height of both rises from six-metres at the top of the lateral walls to an apex of 10-metres. With the adjacent Baptismal Hall and Atriums bolted on to the left with variable 2.8-metres – 3.5-metres ceiling heights (owing to concealed overhead ducts) E&E designed a separate 3.1 sound system in this dedicated zone. 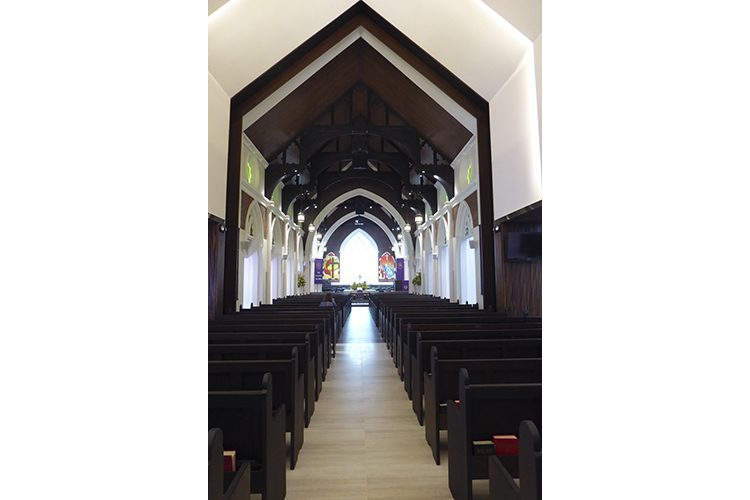 The ceiling was segmented to fit in the aircon ductings and two 55-inch LED video panels were located in each segment to serve five rows of pew seats with each video panel served by its own 3.1 or L-C-R speakers to mirror the speaker layout in the Main Sanctuary seating. Three ceiling suspended clusters comprise the main FOH system for the Main Sanctuary combining EAW QX396i speakers with SB120 subwoofers, whilst three separately suspended MK2396 speakers add further depth and clarity. 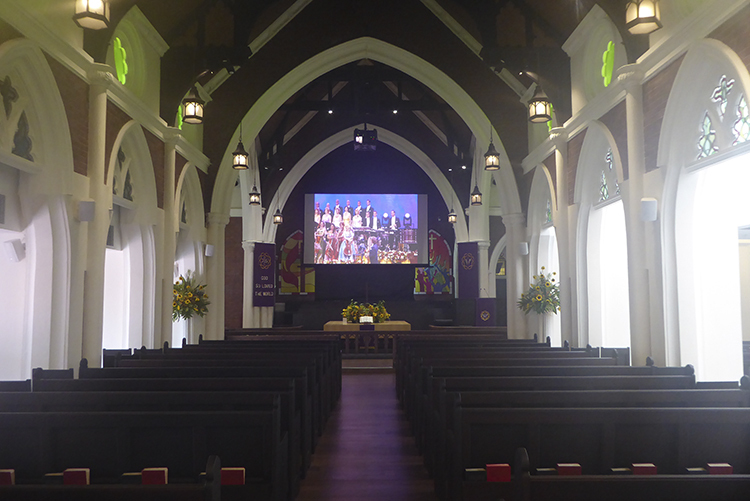 Powered by three K2 and single Ottocanali 12K4 Powersoft amplifiers and connected to the speakers using Belden 7477 cabling, the full range L-C-R system serves the main hall pews. 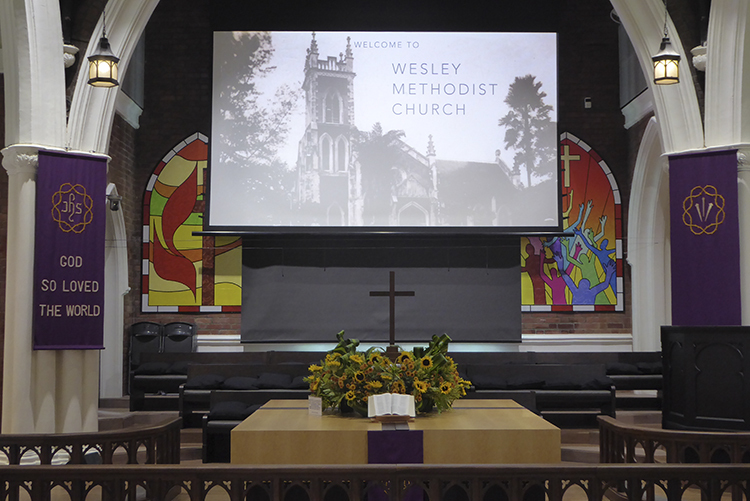 The Baptismal Hall integrates most of the 50 EAW SMS5 5-inch compact speaker system used for the project into the concealed ducting segments whilst some of the SMS5 models serve as fills in the Main Sanctuary. The two-way EAW speaker system is powered by a rack of Powersoft Ottocanali 4k4 and 8k4 amplifiers with its built-in DSP that saves physical space, as there was no need to cater for additional space to house separate DSP hardware and the system was designed on a Dante network meaning lesser analogue cable runs. It also provided E&E with the ability to have individual control and tuning for each speaker to give precise time alignment and delays. In the Baptismal Hall, the amplifier provided enough power and outputs to achieve the individual control. The Powersoft Ottocanali series shines with its outstandingly low power consumption and heat dissipation.